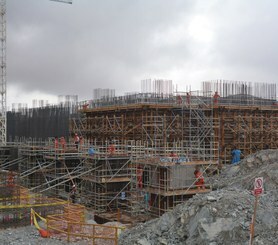 The old Cerro Verde Mine, mainly extracting copper, is currently being expanded for US$ 4.000 million to significantly increase its production. 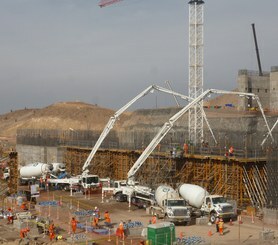 ORMA modular formwork was used for the 2.50 m thick reinforced concrete slab of the new mill. Wind forces had to be included as horizontal loads in the calculation of the structure which increased its weight. ULMA erected high load-bearing capacity T-60 SHORING consisting of towers reinforced with frames and diagonal braces capable of withstanding high loads at height. These towers were braced with horizontal tubes at 2 m height. Each tower's load capacity could thereby be increased by more than 1 t enabling adequate support of the slab. Pre-assembly on ground and lifting by crane provides utmost ease of handling. 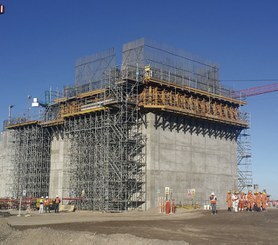 ORMA Modular Formwork was used for the shuttering of the different structures, since it required a system capable of withstanding high concrete pressures, with only few accessories, and one that could be assembled in modules for better handling. 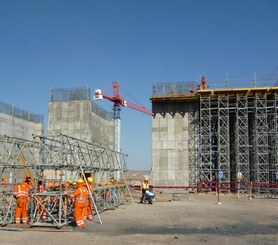 Single-sided formwork at great height and for high concrete pressures was necessary for the construction of the frieze. The SBF BRACKET used for this purpose is a unique structure consisting of welded profiles and tubes capable of withstanding high loads which can also serve as a working platform. For the rest of the project, the BMK CLIMBING SYSTEM was used to provide working platforms and as support for single-sided wall formwork. Moreover, the MK system was used for the masts and main beams. Throughout the entire project, BRIO access staircases were used. Temporary stair towers for the access to construction sites, pedestrian movement in public spaces and for evacuation in case of emergency. Allows diverse configurations.